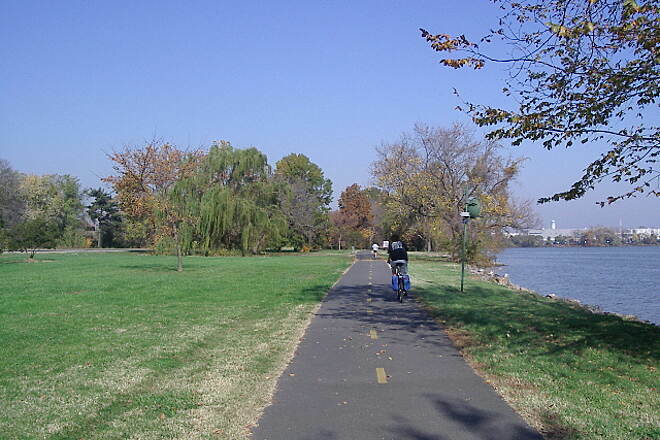 The 18-mile Mount Vernon Trail is one of the Washington, D.C. Metro area's most popular trails. 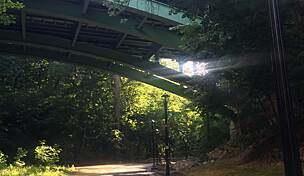 Just across the Potomac River from D.C. in Virginia, the trail links Theodore Roosevelt Island Park with George Washington's Estate in Mount Vernon. 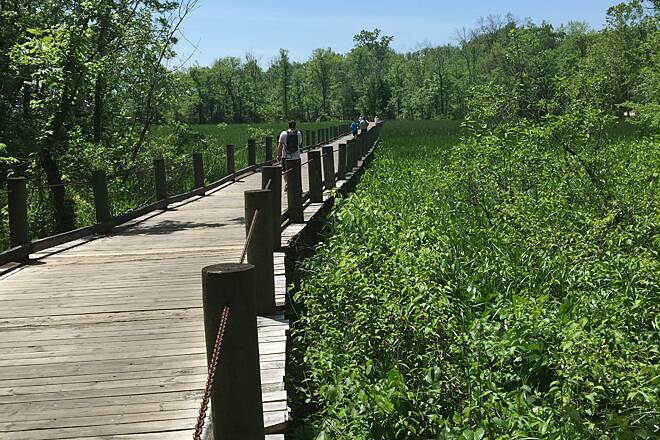 The trail follows the course of the Potomac, passing through parks, yacht clubs, wetlands, neighborhoods, towns and wooded acres. The trail is mostly paved but some sections are boardwalk. In many places the winding trail is narrow, and because it is heavily used (especially on weekends), all recreationists—whether on foot, skates or bike—must use caution when passing others and when entering the trail from any of its many access points. Cyclists must dismount at some bridge crossings. At the midpoint of the Mount Vernon Trail, navigating Old Town Alexandria can be tricky. You have two routes to choose from, both of which are on-street. From north to south, one route follows E. Abingdon Drive to Bashford Lane to Royal Street. 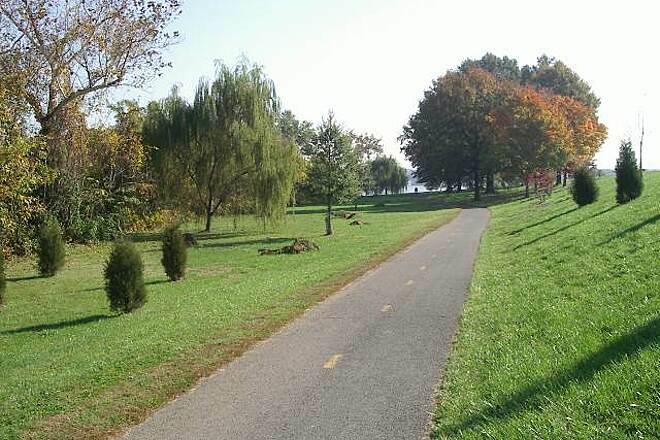 Or you can simply ride along George Washington Memorial Parkway and pick up the trail again south of Interstate 95/495 (on the river side of the road). The other route, more preferred by some, veers to the left (coming from the north) and picks up Union Street. From here you have easy access to Alexandria's waterfront parks, restaurants and shops. The marina boardwalk area is lively, with all kinds of entertainment year-round but mainly between Memorial Day and Labor Day. You can return to the trail at the end of Union Street near the nice townhomes along the river. Approaching the Woodrow Wilson Bridge (I-95/495), you can detour east across the Potomac River on the wide, paved Woodrow Wilson Bridge Trail flanking the northern side of the bridge to reach National Harbor in Maryland. Here you'll find dozens of shops and restaurants, not to mention the occasional waterside entertainment (water-ski shows and boating events). Otherwise, continue under the Woodrow Wilson Bridge to take the trail through more parks, marshlands and tidy neighborhoods. As you near the Mount Vernon Estate, the trail begins a steep climb through the forest where it ends in the parking lot for the estate grounds. On a hot summer day you can slake your thirst at the visitors center and rest in the shade of the trees. 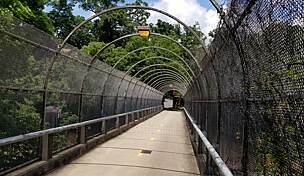 At the northern end of the trail, at the parking lot for Roosevelt Island, you can explore the island park's ring trail via a footbridge over the river. 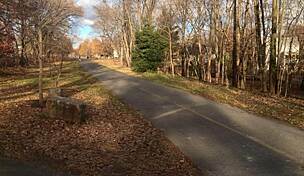 Also, from here, you can take a pedestrian bridge over the road and pick up the Custis Trail, which leads to the W&OD Trail. Theodore Roosevelt Island: Access via the northbound lane only of the George Washington Memorial Parkway. Parking can be limited on weekends. Old Town Alexandria: Access from I-495; take the Patrick Street/US 1 Exit north and follow the signs to downtown. Or take I-395 to the King Street/State Route 7 Exit and head east (south), following the signs into town. 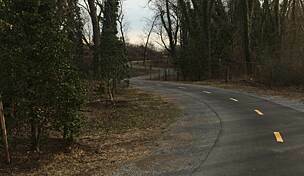 Mount Vernon Estate: Access at the southern terminus of the George Washington Memorial Parkway. For information on more access points, visit the National Park Service website. 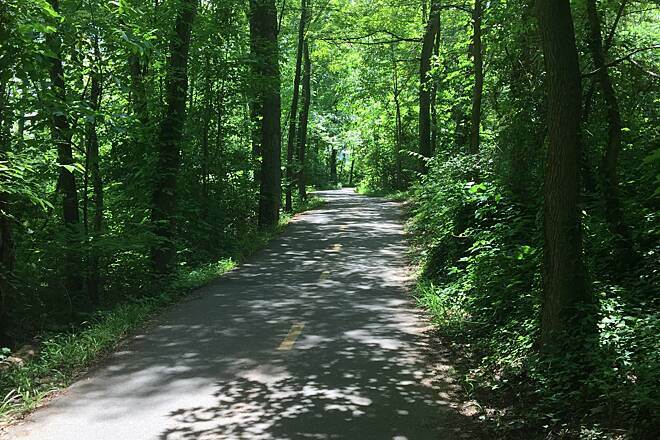 The Mountain Vernon Trail is also accessible from Washington, D.C. Metro stations on the Blue and Orange Lines. 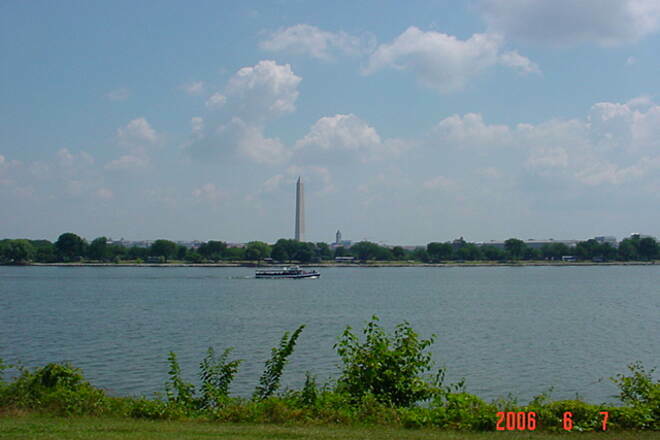 The Park Service website has more information, or you can visit the Washington Metropolitan Area Transit Authority. This was the first "designated" recreational trail I ever rode, back in the mid-eighties, after I bought my Peugeot (now 6 bikes ago)in the bike shop on Wash. St that is now Williams Sonoma. I spent many hours riding up to Mt. Vernon and circling Ft. Hunt Park. This trail is great year round but particularly in the autumn. 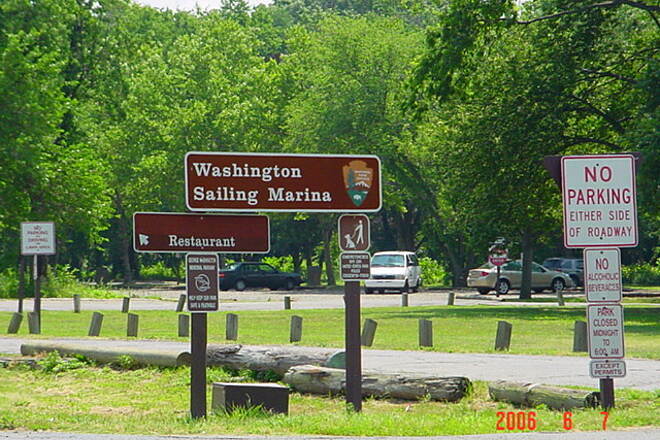 Great view across the Potomac of Ft. Washington, and lunch at Mt. Vernon is a treat for your turn around point. As the review says, VERY CROWDED on weekend in the summer, be very careful, I have seen some bad bike/pedestrian crashes. I was visiting Alexandria and DC last weekend, and read the reviews here before renting a bike and heading to Mt. Vernon. The reviews were spot-on about the crowds and kamikaze bikers, so you do need to ride defensively. But the trail was worth it. I live in the flatlands, and I loved riding the winding, twisting, rolling path...it reminded me of where I grew up in WV (no, the hills weren't that high). But it was truly an escape into the woods with lovely river views. I was riding a comfort bike and wasn't sure I would make it to Mt. Vernon in the time I had--but I did! I had plenty of time to enjoy vanilla cherry ice cream at Mr. Washington's home before heading back to Old Town. I was happy to see you could rent a bike lock at Mt. Vernon and spend the day, if you wished. I did find the trail area around Washington St. in Old Town (OT) Alexandria to be confusing--I failed to turn left heading out from OT, but was re-directed back to the trail by a fellow biker. Heading back to OT from Mt. Vernon, I was again unsure about which way to go, so I rode the streets of OT to return my bike. Biking time was about 2 hours round trip. Wonderful day--I can't wait to go back. We started at Roosevelt Island and went south to Alexandria Va. The smooth asphalt, shade, views of the Potomac River and Washington Monument across it, gentle rolling hills, and varying landscapes made this a magical ride. Stopping to watch the airplanes fly over head at Reagan National Airport and getting a quick drink in the cafe at the Washington Sailing Boat Marina where a few highlights. We started our trip about 5:00 PM which put us in Alexandria (approximately 6 miles away) at dinner time on a Saturday night. After a quick bite to eat we headed back north with a detour across the river to see the Lincoln Memorial and arrived back at the car at 8:30. Perfect evening ride with lots of stops and interesting sights. 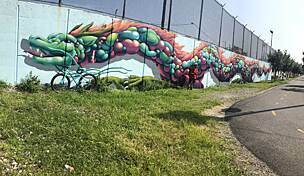 I started this trail at the Rosslyn, VA end, which is off the corner of N. Lynn Street and Lee HWY. 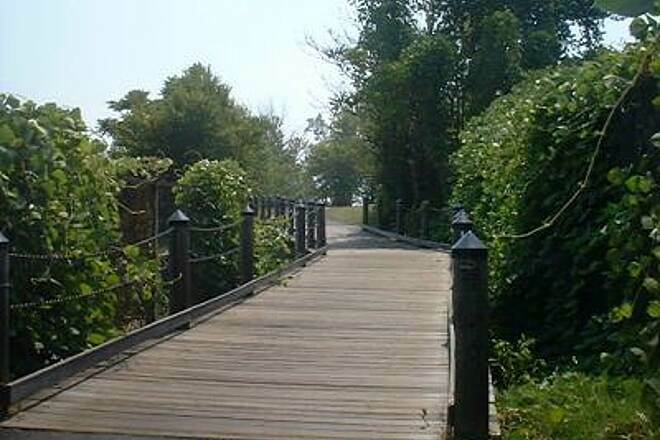 The trail is mostly flat asphalt and some brick boardwalk, as advertised; however, there are three bridge crossings that will take you on some moderate slopes. Near the last five miles towards Mt. Vernon are a series of slopes; they're not really sever, but they do come at you one after the other. The course is about 65%-70% heavy woods with parts of the course bordered by wetland, so make sure you have a good coat of your favorite insect repellant. The course is well marked from Rosslyn to Alexandria and from the 8.0 mile mark to Mt.Vernon. I ran the route through Union Street last year, and through Old Town Alexandria (Washington St.) this year, and saw very few signs distinguishing the Mt. Vernon Trail. I got an early start on a Sunday morning around dawn and finished about 8:30 a.m. There were a few cyclists in singles and in small groups, however they all gave courtesy bell rings and/or verbal warnings. 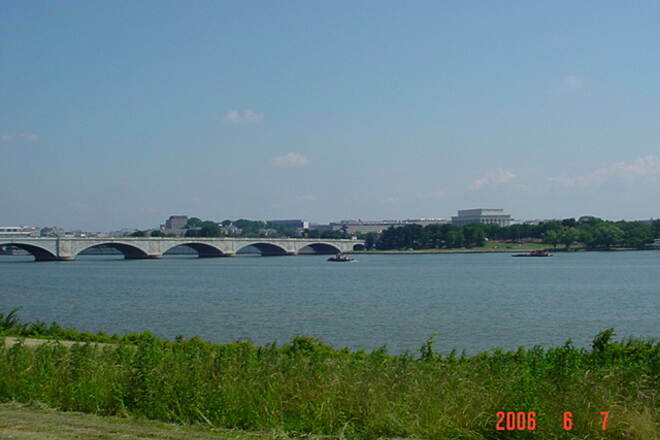 There are great views across the Potomac for the Washington and Jefferson Monuments, as well as Reagan National Airport. There are restroom and port-a-john services at some of the parks on the course, though you may have to depart the trail to find them. For out-of-towners, there is Metro service from Arlington to Rosslyn (about 5 min.) When you finish the course at Mt Vernon, there is very inexpensive bus service (Fairfax Connector) at the Mt Vernon Orientation Center, that can take you to the Huntington Metro Station. The Mt. Vernon is an excellent course, especially if you're a marathoner in training. Just make sure you pay close attention to the signing along the route. I use the Mt. Vernon trail between DCA and downtown on a regular basis to commute to and from work and to train for marathon races. I love this trail, it is NOT a bike path, it is a multi-use trail. There are hundreds of people on this span during peak use hours/seasons. Cyclists and pedestrians, long-time users and newbies alike need to be respectful of one another. I was struck by a bicyclist from behind two weeks ago during peak evening hours. The rider was not considerate. The rider was wearing headphones and holding a phone. I was not walking on or close to the center line. Many riders passed me that afternoon traveling at speeds to cause me concern and to feel the swish as they passed. Some states are policing their trail systems with speed guns and fining riders. I don't want to see this when simple respect is all that is needed. Please, people. This trail has a good surface for bike riders. It also has historic relevance and a long history. It is popular with families and groups that make it a weekend choice. 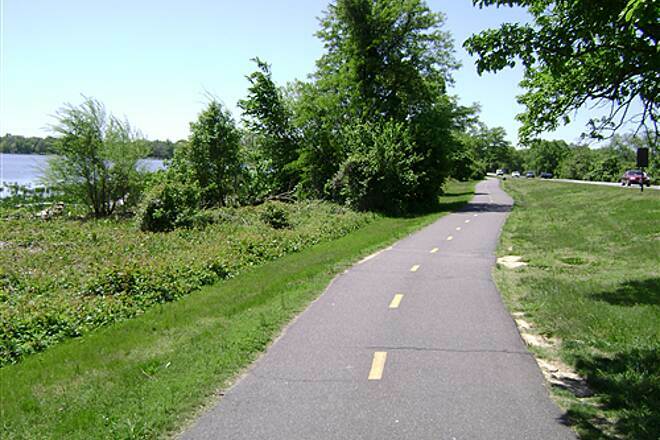 I commute from Alexandria to DC on a bike using this trail. In the early morning it's a wonderful ride. As the day progresses it gets busy between DC and Alexandria. Too many pathletes, and zombie walkers with total disregard for trail etiquette. The pathletes, or Lance wannabes if you will, give cyclists a bad rep. Shame. Often too, you'll see families that don't seem aware of all the traffic around them. Sweet oblivion. All that being said it's a fantastic ride provided you're careful. The trail was indeed beautiful as many have said. We decided to give it a try over the weekend. Although it was a weekend, it was not particularly crowded. However, the 40 or 50 pedestrians/cyclists we did encounter showed an absolute disregard for etiquette. Not one other cyclist actually stopped for any of the stop signs that we saw. EVERY stop sign has a sign above or below it instructing cyclists to dismount or walk their bikes across the road. Few of the cyclists were actually obeying the posted 15 mph speed limit. Additionally, the pedestrians felt it was okay to stop and congregate on the trail in the tight curves. In the five mile stretch we road: were were nearly in 2 head on collisions, almost run over at 4 stop signs by cyclists, flipped off by a pedestrian for daring to announce we were passing, and the list goes on. 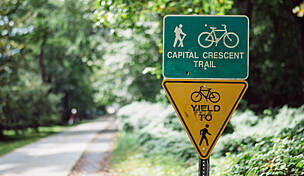 The trail itself is too narrow to accommodate both cyclists and pedestrians. It is also in enough disrepair to be dangerous to road bikes. One of the wooden bridges appeared to have rotting wood as the surface, and the asphalt had numerous potholes, cracks, and missing chunks in the twisty-windy down hill curves (REALLY dangerous if you are moving faster than 10 mph). I run on this trail but it is paved so I always see lots of bikers. Teddy Roosevelt Island has parking and bike racks (no bikes allowed on the island) but has a 1.5 mile looped dirt trail that is great. There are also several water fountains and a set of restrooms about a half mile to the right after you've crossed the bridge onto the island. We left National Harbor around 8am in the cool of the morning this summer day in August. It was a great ride but as everyone has said, there are some hills and curves to challenge, especially on and off the Wilson Bridge. We had a hard time finding the trail when we came to the end of the bridge but with some help from a fellow bicycler we found it. 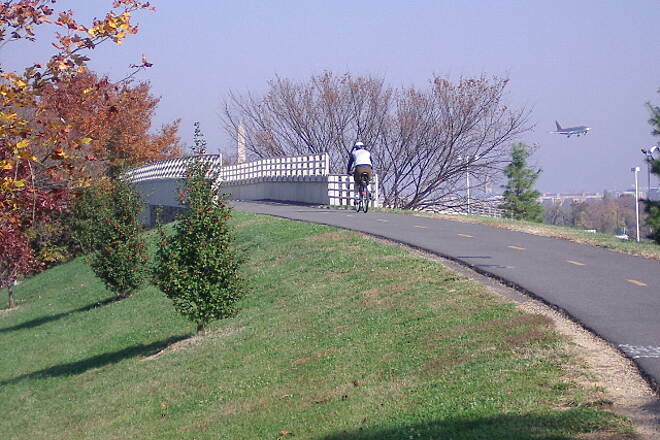 When you get to the end of the bridge, if you are going into DC, take the Fort Footpark path. There were some on the street routes, I think we missed some of the less traveled streets but found them on our return. That part of the trail is a little tricky to find. 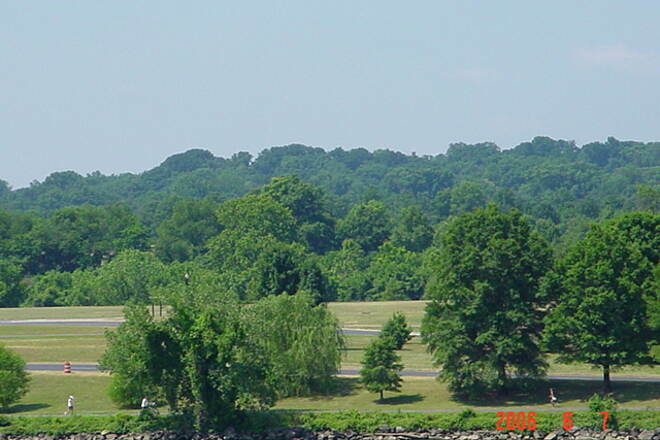 All in all the trail is wonderful, covered trees at times, places to stop and enjoy the views and Potomac as well as National Airport. I've seen DC many times but always on foot. Seeing the sights via bike is the way to go when there isn't a crowd in DC (during the week). The sidewalks and pathways are wide in order to facilitate both walkers and riders. You can ride all the way to the Capitol by traversing the mall grass area. one of my favorites. You can bike from Mt. Vernon all the way up to Teddy Roosevelt Island. Parking at Roosevelt Island and walking across will yeild a wonderful surprise and break during the ride. The potomac views of the monuments and city are picture perfect. 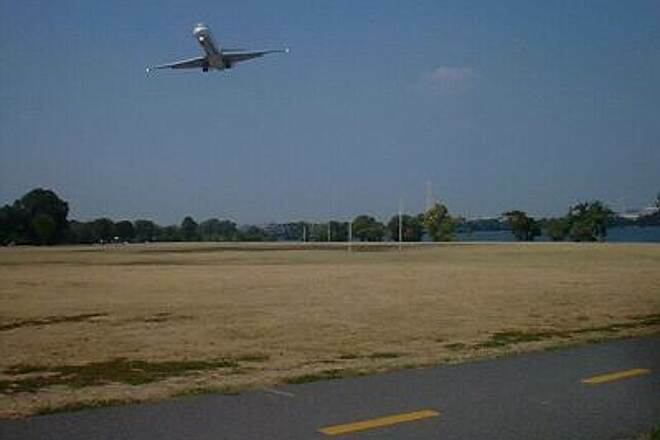 Plenty of places to rest, watch air planes take off and land (Reagan National Airport)and have a wonderful picnic lunch at waterfront bench or an Old Town restaurant. This trail has it all. *Some locations do proceed very close to vehicle traffic on the GW Pkwy so parents beware if having small children on bikes. Most locations however are fine for the kids, just plan ahead. I did this trail round trip on 9/30/12 and it was a great ride on a great early fall day. From the Washington DC. end down to Alexandria this trail is a very busy place, but the crowd thins out at about ten miles from the DC. end. This is not a Rails to Trail it is a Greenway so it dose have some hills, twists and turns to it. I rode my older Mt Bike with a Town and Country tire and it worked for me and I did need the extra gears a couple of times. I saw just about every type of bike on my ride so if it has wheels it will work. This trail is an older trail and is a little narrow some of the time. From Alexandria south it has a great canopy and I would say the whole tail is family friendly. It has Restrooms, Water fountains, Park Benches, Picnic Areas, Historical Markers and it runs along the Potomac River so you have a great view the whole ride. If you do this trail make sure that you leave you self enough time to do the Woodrow Wilson Bridge Trail as it is the best two or so miles that you will ever ride. If you live in the DC. area this trail is a great one and I would highly suggest that you have a mirror as it gets very busy. This was my 1st time (7/22/2012) riding the trail and I did not know what to expect. I started at the National Harbor and traveled to Mount Vernon (23 miles round trip). This particular day I went out at around 1pm, which is not typical for me; I usually ride no later than 7-7:30 am or earlier to avoid all the traffic. So to avoid large traffic volume, I suggest you go in the mornings; evenings are typically worse because that tends to be family time. 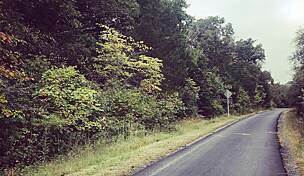 The trail is narrow but marked for 2-way traffic and can have lots of foot (including kids and animals) and bike traffic on certain days, but mostly at certain time of the day; it travels along the Potomac River, through the woods, marsh area and some residential neighborhoods and has some rest areas along the way. The trail offers some nice hills, curves and bends if you are up for the challenge, but what I did not know about is the last hill leading up to Mt Vernon, so be warned to drop to a low gear when traversing the sort of curving steep hill. Some areas on the trail can be pretty slick if it’s damp, especially when there are wet leaves on the trail. Also, be aware that the wooden bridges are very, very slick, so cross them with caution; I saw the one leading to the steep hill take out a rider. I could not do too much viewing because I was on my road bike, but the mountain bikers (MTB) may find more opportunity to look at the scenery. Basically what I am saying is you need to be extra careful while on a road bike because the margin of error is much thinner than on a MTB (i.e. all terrain bike is what I call them) on this trail, however; I plan to take my MTB down that trail so that I can take in more of the scenery. Oh, I did encounter some fools that would overtake walkers around blind curves and in one incident almost hit walkers in my lane, including me on my bike; idiots are everyone. Overall it is a fun trail. I will head the opposite direction at some point and write a review on it. I think because it was Friday and in the evening, there were fewer people on the trail compared to weekends and the more northern section closer to D.C. (which generally has lots of varied traffic - walkers, kids, pets, super fast bike racers, and so on). The last two miles heading into Mt. Vernon are mostly uphill and some areas like the last few hundred yards reached about a 7% grade, so drop to your lowest easy gears and keep peddling! The 0-mile marker is located as you enter into parking area slightly obscured by trees from the visitor center where you can buy refreshments and use the rest room (highly recommended). Along the trail you will find several other "sanitary" facilities for mother nature's call, but the two we visited (one traveling south, the other on our way north) were a bit stenchy in the hot summer weather. We loved the steep hilly inclines of the last three miles because you can pick up good speed to the point that it makes getting up the next hill a lot easier if you can keep your momentum up. Personally, I found it easier to climb the hills by keeping my cadence closer to 100 so that the bike did more work than my body. It takes a lot of shifting, but it pays off. 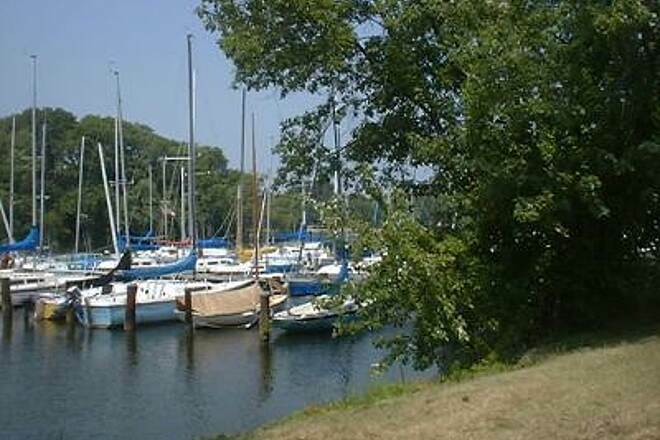 The varied surfaces combine greatly different scenery as you ride along the picturesque Potomac, over boardwalks in swampy sections into densely wooded areas, and through upscale neighborhoods. Old Town is quaint and very pleasant - just watch for peds and cars! Two Thumbs Up for this trail! Rode out and back on a nice but cool fall day. The Washington end was very crowded with joggers bikers and walkers. as we progressed eastward the crowd thinned out to a more acceptable level. Most people were courteous with the exception of the wannabe Lance's who past on turns and with oncoming bikes and pedestrians giving the rest a bad name. With this trail this was unacceptable due to the crowd. Most joggers seemed to be totally absorbed with their ear plugs shoved deep into their ears to the point of not hearing you but they were at least to the sides so passing was not an issue. 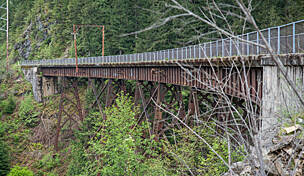 This trail is a marvel of engineering. 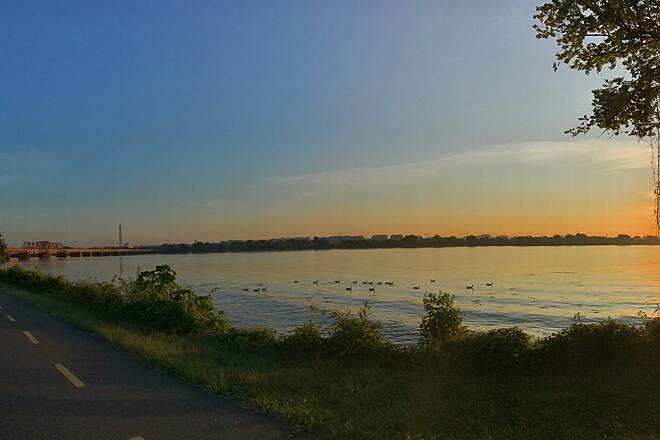 It has variety, goes through dense wooded areas, along the Potomac, around the National Airport, through Old Town Alexandria, across from the National Mall, and has breathtaking views all along the way, from Rosslyn to Mt. Vernon. The trail is well paved, clearly marked and beautifully maintained. There are several rest stations with water (when they are working) every few miles. But, be warned, on weekends it is crowded with weekend athletes, pedestrians, kids, and worst of all, wannabe Lance Armstrongs in their obnoxious spandex outfits, racing along the trail, making it an often dangerous and tricky place to ride. These men and women have little regard for others, display a complete lack of trail etiquette, and speed much faster than they have any business to on such a popular path. I live in Alexandria and make a point of staying away on weekends. But mornings on weekdays are wonderful. This trail is a very nice ride. 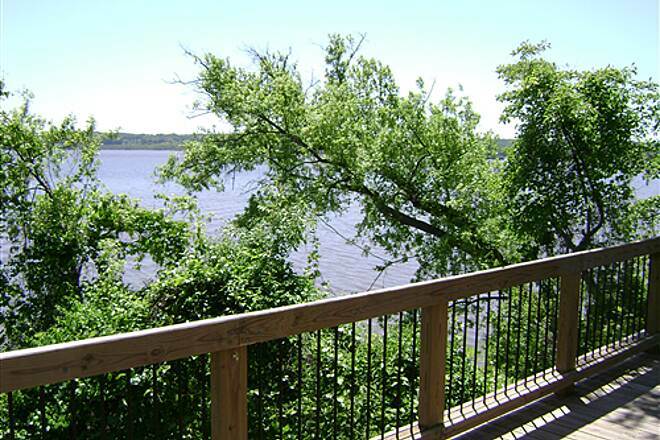 It has terriffic views of the Potomac River. There are a number of picture stops. It is a mild challenge, a little hilly. Visiting Mount Vernon makes the ride worth it. I would recommend the trail, just not on a weekend. On Saturdays and Sundays the trail is busy with walkers, joggers and families, some with pets along. This sharing should not present a challenge to riders just sightseeing. However, the Lance wannabes make the ride or walk dangerous. The overall etiquette of the DC area riders is poor to non-existent. Only one in ten would announce their presence when overtaking you. A near head-on collision really increased the heart rate. While allowing for some walkers to pass each other before my wife and I could safely pass them, (single file) a rider came around a bend and out of a tree lined protion of the trail speeding directly at all of us. The walkers scattered, leaving me to face him head-on. I went left, he swerved onto the grassy area. The walkers converged to him, telling him that he was travelling too fast. There were numerous brush-bys from other speeding riders that made the overall experience a little uncomfortable. Beautiful Trail - but has some challenges! We spent two days riding the Mount Vernon trail. We were staying in Alexandria and rode the northern part the first day. The trail is well marked and easy to follow. The views along the river are beautiful. Unfortunately, I am a recreational rider and I was in fear for my life for most of the northern portion of this trail. There are many twists and turns which would have been fun except the trail was very crowded and the Lance Armstrong wanna-be's were weaving in and out so quickly you had to be on guard at all times. It was hard to enjoy the trail and views because you had to constantly be concerned about meeting someone head on or someone passing you. We saw a pretty serious accident with someone being taken away on a body board with neck brace and bloody face. The second day started out much better with fewer people on the southern end of the trail. 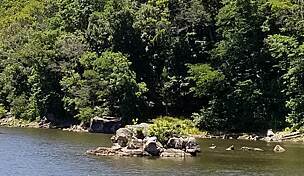 Again the views were beautiful along the Potomac River and the trail was very well marked and well kept. The problem I had on the southern end was there are several serious hills to climb! We had already purchased tickets for Mount Vernon and I really wanted to be there for the 4th of July. If not, I probably would have turned around and not finished the trail to Mount Vernon. The last mile is all up hill. 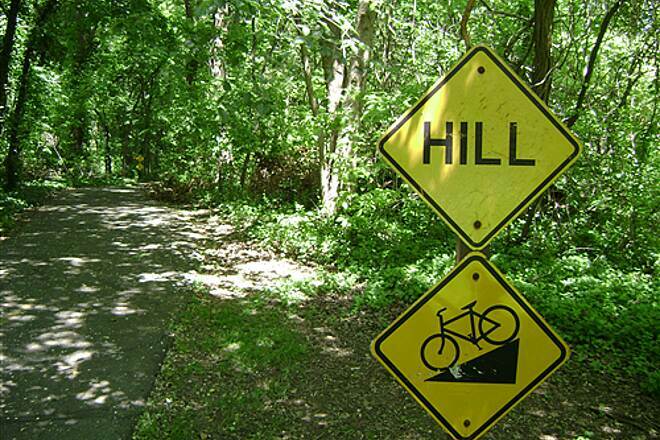 But that's ok - when the hill gets too steep, get off and walk that bike for a while. There is no shame in that! The trip back to Alexandria was much easier and enjoyable. Even though the hills were tough on the southern end I enjoyed the ride more because the trail wasn't as crowded. Overall it was a great ride with beautiful scenery. I just started using this trail. 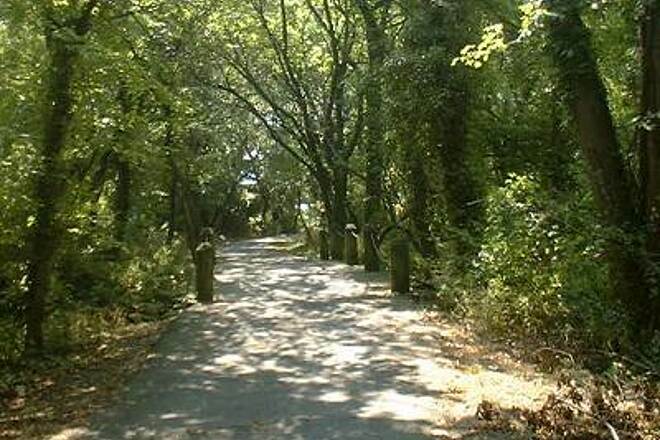 It is a really good trail for a walk or even a bike ride. Just be aware if the more experienced bikers if you are just beginning they are really good at letting you know when they are passing you but they pass by usually kind of fast. 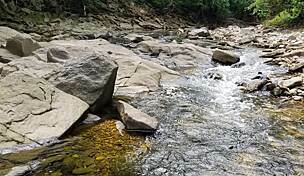 It is really beautiful along the southern part of the trail as you are right there along the river, so take some time to just relax and take in the view. Rode the trail on the first day of fall. Weather was great. Temperature about 70 degrees and the humidity was low. Started at the Mount Vernon end of the trail. Parking was free and easy to find. The trail starts at the north end of the east parking lot. An extension is in progress to bring the trail pretty much to the front entrance of Mount Vernon. The trail is mostly in the shade and pretty scenic. The portion through Alexandria is well marked along Union St. However,it has moderate to heavy vehicle traffic. Take a break to eat at Gadsby's Tavern. Located three blocks up from Union St. on Cameron St. at the corner of Cameron and Royal Sts. Washington did'nt sleep here but,he did eat here. Along with Thomas Jefferson and others. Another good site is Stabler-Leadbeater Apothecary¿ at the corner of King St. and Faifax St.,two blocks up from Union St. The only negative on the trail were the Lance Armstrong wanna-be's. You know,the one's with a fancy bike and spandex outfits. On the weekends and holidays,these folks use the trail like it is a velodrome. It is bad enough riding a wide trail with these guys. But, on this trail with the narrowness,trees and curvy route it is deadly. We racked up our bikes in Connecticut and headed to the DC area and this trail for the Memorial Day Weekend. 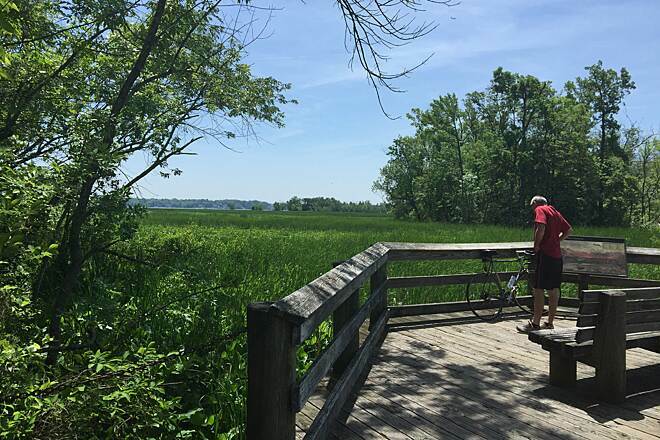 The Mount Vernon Trail was on our "to do" list for a while and it didn't disappoint! The weather was great, the trees were in bloom, and the sky was blue. We rode from Rosslyn to Alexandria and back and enjoyed the monument sites in DC from along the Potomac on the Virginia side. I suggest you walk your bike on the narrow highway overpass and the very narrow single lane highway underpass. You will find some hard chargers in both areas that insist on riding through and look at you disparagingly. 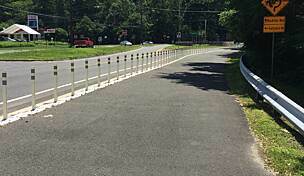 Just stare them down, it’s a public bike path! On the flip side, we stopped twice to make some bike adjustments and tighten shoe laces. Both times more courteous riders called out to make sure we were OK and ask if we needed help! I love Southern hospitality! Just outside Alexandria and around the corner from a bike shop was a deli with great sandwiches. Of course, in Old Alexandria there are countless restaurants and bike racks if you want to stroll on the dock and shop. Riding on the docks is not allowed. The trail path is paved and can be a bit narrow, but it is very enjoyable. Set your own pace. There are riders of all levels, from tots on training wheels to Olympic wanna-be’s. We had a great ride. We racked up our bikes in Connecticut and headed to the DC area and this trail for the Memorial Day Weekend. The Mount Vernon Trail was on out "to do" list for a while and it didn't disappoint! The weather was great, the trees were in bloom, and the sky was blue. 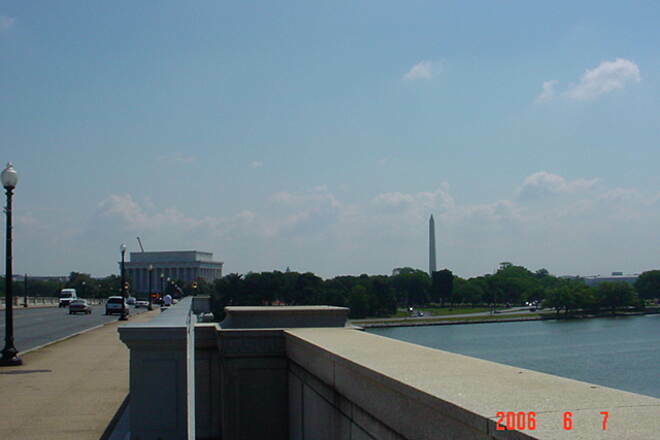 We rode from Rosslyn to Alexandria and back, enjoyed the monument sites in DC from along the Potomac on the Virginia side. I suggest you walk your the bike on the narrow highway overpass and the very narrow single lane highway underpass. You will find some hard chargers in both areas that insist on riding through and look at you disparagingly. Just stare them down, it’s a public bike path! On the flip side, we stopped twice to make some bike adjustments and tighten shoe laces. Both time more courteous riders called out to make sure we were OK and ask if we needed help! I love Southern hospitality! Just outside Alexandria and around the corner from a bike shop was a deli with great sandwiches. Of course, in Old Alexandria there are countless restaurants and bike racks if you want to stroll on the dock and shop. Riding on the docks is not allowed. The trail path is paved and can be a bit narrow, but it is very enjoyable. Set your own pace. There are riders of all levels, from tots on training wheels to Olympic wanna-be’s. We had a great ride. Only tricky parts are the high traffic areas around Alexandria, you may encounter some pretty annoying bikers on busy days. The detour through Old Town is a scenic but out of the way. This was my first time riding the trail. 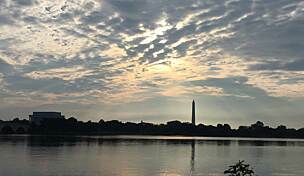 I parked at Daingerfield Island and rode over to the Washington Monument. My next trip I want to go up to the Key Bridge. This is an awesome trail. I had a great time. Email me with any questions.